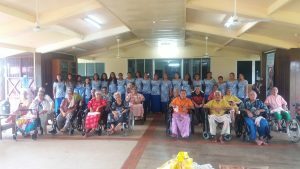 The 2017 OFC U-16 Women’s Championship in Samoa, this August will not only showcase the best young female footballers in the region, it will also provide a crucial platform for an awareness campaign focused on ending violence towards women and children. The #ENDviolence campaign focuses on changing perceptions towards women and violence in the Pacific region. In collaboration with UNICEF, Oceania Football Confederation has called on football role-models from the Pacific to join ambassadors from across the world in the #ENDviolence campaign. The aims of the campaign are to develop respect, understanding and tolerance among girls and boys, women and men and the community as a whole, with the overall goal of reducing risk factors associated with gender-based violence in the Pacific. Using the 2017 OFC U-16 Women’s Championship, the campaign will look to engage both a community and sport based audience, creating a unique platform through which to disseminate critical information on #ENDviolence. Over 50 per cent of children aged 13-15 years reports being bullied, with 30 per cent reporting an attempt to commit suicide in the past 12 months. In addition to affecting women, violence also has a detrimental impact on children. Globally violence against children costs up to USD 7 trillion dollars. At this cost, violence against women and children can significantly impede a nation’s efforts, crippling key members of society. In an area of the world were access to information is restricted by poor internet, television and radio penetration, the #ENDviolence campaign seeks to create awareness, create sporting champions who will speak up against violence and support broader community awareness on violence towards women and children throughout the region. In addition to the awareness publicized during the tournament an official launch of the campaign was held Wednesday night at the Taumeasina Island Resort. More than 250 attended the launch including the players and officials of the tournament. The official keynote speech was delivered by UNICEF representative Tupe Aumua-Esera and closed by FFS President Laupama Solomona. The 2017 OFC U-16 Women’s Championship resumes play on Friday 11th August with Cook Islands taking on Fiji and Tonga playing American Samoa. Samoa plays New Zealand on Saturday along with Tahiti and New Caledonia.